The Concord grapes our coop buys come from the same grower we get our apples from: a family that takes care to spray their crops as minimally as possible (IPM). These grapes are truly amazing, and so fragrant. Our whole house smells lovely when we’ve stacked our grape boxes in the kitchen for processing. Concord grapes are very sweet, very juicy, and they have skins that slip off when you bite into them. 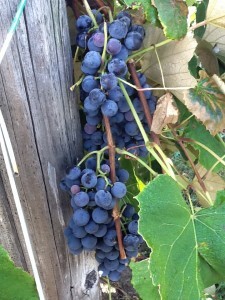 Because these grapes have seeds, they are most often used for making jams or jellies, wine or fresh grape juice. But many people in our coop tell us that they just eat them fresh. If you do intend to eat your grapes fresh, keep them in the refrigerator and plan to use them up within a week and a half. That’s about how long they’ll keep. We order grapes in October, along with several varieties of apple. If you’d like to be notified when the pre-order begins, sign up on our email list, and select Concord grapes as one of your interests. We do not ship Concord grapes.